We are going to look at calculate difference between two dates using Excel VBA UserForm. 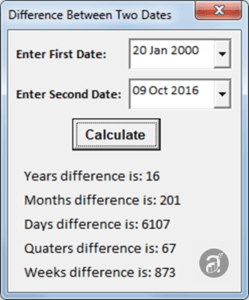 In this section, we are calculating difference between two dates in days, weeks, months, weeks and years. Following is the step by step detailed explanation to automate this project using VBA UserForm. Let me explain the key steps to develop this UserForm to find difference between two dates project.You can see the design of the UserForm in the following section. Step 1: Create UserForm: We have to first create the UserForm from the Insert menu in VBA Editor. Step 2: Place toolbox controls on the created UserForm: Place required controls on the UserForm. You can drag the controls from the toolbox and drop controls on the UserForm. You can find detailed UserForm design details in the following section. Step 3: Set properties and alignment of all controls: Properties of each control has to be set. It is shown in the design section. Step 4: We are going to create procedures in the VBA editor window. Please find the following approach for the same. Step 4.1: TurnOff screen update and Events: We are temporarily avoiding screen flickering and events triggering in the application. Step 4.2: Variable Declaration: We are declaring required variables which are using in our procedure. Step 4.3: Input Values: Assign input values to a variables. Step 4.4: Calculate difference between two dates using ‘DateDiff’ Excel VBA function. Step 4.5: Turn On screen update and Events: Let’s reset the screen update and events of application. By changing or setting all the above properties and values of each control on the form will be looking like below. Step 2: Disable Screen Updating is used to stop screen flickering and Disable Events is used to avoid interrupted dialog boxes or popups. Step 3: Calculations for difference between two dates. Step 5: Enable Screen Updating. Dont forget to enable screen update. Please find the following procedures to create UserForm and find difference between two dates. Double click on the Userform(frmDateDiff) and add the following code to it. Here are steps to calculate difference between two dates using UserForm on the worksheet. Right click on the shape, select Edit Text. Enter name as ‘Show UseForm’. Format shape according to your wish. Again right click on the shape, select assign macro. Add the following statement. Insert a new UserForm and design the userform as per the above mentioned instructions. Double click on the userform. Copy the above procedure and paste it in the code window. You can hit show UserForm from on the Worksheet. Select two dates by clicking on date and time picker control. Click on Calculate button. Now you can see the final output on the UserForm below the Calculate control button. Here is the sample screen shot of the entire project output for your reference. Here is the workbook macro file to explore yourself. 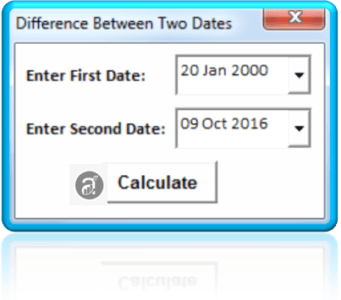 This file helps you to calculate difference between two dates.